A coordinated day of protests around the world last November 5 was planned by members of the amorphous hacktivist group Anonymous. New documents indicate that Anons weren’t the only one interested in those events, however. . . . From Description posted with video. 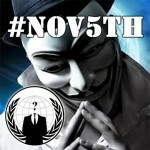 Thousands of people worldwide joined Million Mask March rallies organized by the amorphous Anonymous movement. Rallies, both peaceful and confrontational, protested austerity, surveillance, corporate greed and corrupt governments. From Sydney to Los Angeles, from Johannesburg to London – thousands came forward to make their voices heard. Among key ideas which virtually connected all different protests were anti-capitalist idealism and the rejection of NSA surveillance. Some rallies had a sense of carnival, where whole families with kids marched in protest, while other gatherings – like in London and Washington – turned more intense, with people not hiding their rage. . . . Read Complete detailed Report with great photos. This November 5th, the “World Wide Hackers Group” Anonymous says that it will target government facilities… all over the globe. Anonymous #OpNSA – Paperstorm scheduled for the 2nd, 20th and 30th of September. Spread the truth! The hacker collective Anonymous has not produced as many high-profile cyber attacks as it once did, a drop-off that can be directly attributed to the arrests of the group’s core members, an FBI official told The Huffington Post this week.